There is a well-documented link between smiling, happiness, and overall quality of life. This notion was put to the test during a longitudinal study titled “Smile Intensity in Photographs Predicts Longevity.” In the report, researchers found that healthy adults who reported high levels of life satisfaction also happened to be smiling in high school yearbook photos (i). By contrast, adults who reported relatively lower levels of satisfaction and happiness demonstrated worse oral health and serious, stoic, or otherwise smile-less high school photos. The results of the study have long since promoted the idea that smiling regularly, when combined with proactive oral health care, can reinforce feelings of happiness over time. 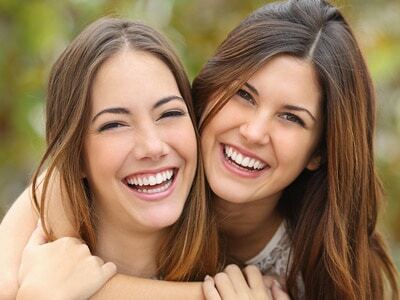 The connection between oral health and happiness has also been demonstrated among young adults. In a recent study of nearly 200 first-year Romanian medical students, researchers noticed a strong correlation between gum health and participants’ reports of overall life satisfaction. While students with excellent gum health reported high feelings of satisfaction and happiness in life, those students with poor gum health reported feelings of dissatisfaction and unhappiness (ii). The study took things a step further by observing students’ brushing and dental check-up habits, and the results illustrate a similar trend. Students who brushed often and maintained regular dental check-ups reported higher levels of happiness compared to those who brushed infrequently and did not regularly visit a dentist (iii). “There’s a certain ‘ick’ factor associated with gut bacteria,” explains Lita Proctor. “People tend to think of them as germs and disease-causing pathogens, but they’re actually part of our bodies.” As director of the Microbiome Project, Ms. Proctor has dedicated her professional career to characterizing the thousands of bacteria that call the human gastrointestinal (GI) tract their home. For a healthy adult, that amounts to roughly 5 pounds of bacteria, which is about the weight of the human brain (iv). A growing body of research indicates that overall health and happiness requires the adaptation of healthy GI bacteria, or intestinal flora. In fact, science has long referred to the connection between GI tract and happiness as the Gut-Brain Axis. Since the late 19th century, dozens of studies have credited the Gut-Brain Axis with the onset and persistence of certain emotions, like happiness (v). Beyond triggering emotional states, the Gut-Brain Axis also seems to have a direct physical effect on the body, and the oral cavity is no exception. Just last month, researchers at the University of Florida dialed-in on a very specific gut bacterium that might be able to prevent cavities, a finding that underscores the intricate connection between the GI tract and oral health. As gut-brain studies continue, we are likely to see more evidence demonstrating that happiness and oral health are fundamentally built from a well-balanced GI tract. Across all ages, demographics, and borders, studies indicate that individuals feel happier when their teeth are clean, well aligned, and cavity free. Below are a few basic tips for anyone who would like to proactively adjust lifestyle to promote health, mood, and happiness. Brush and floss daily. Basic oral hygiene is the best starting point for anyone looking to improve mood and oral health. Brush and floss up to 3 times each day: Morning, after lunch, and before bedtime. Avoid the use of mouthwash, since many alcohol-rich mouth rinses have been linked with oral cancer. Balance GI tract. Researchers are increasingly linking declining mood and poor oral health with imbalances in the GI tract. To learn more, visit our How to Heal a Leaky Gut article series. Reduce stress. Stress is known to weaken the immune system and trigger short-sighted reward systems, like cravings for sugar and starchy carbohydrates. Both can take a toll on oral health, so be sure to proactively de-stress each day. Mindfulness meditation, coloring, journaling, and long walks are just a few examples of easy ways to unwind. Eat well. Take time to eat a well-balanced diet rich in all the minerals needed for healthier teeth. Readers may also experiment with no-sugar diets to further reduce the risks of obesity, type II diabetes, tooth decay, and oral infections later in life. Keep up with doctor appointments. Many illnesses can be effectively managed when diagnosed early. Stay up to date with general health physicals and dental check-ups. For children, this means a regular dental cleaning every 4 to 6 months. For adults, dental check-ups and cleanings should happen every 6 months maximum. At Assure A Smile, we believe life-long healthy teeth and gums are the product of proper nutrition, diet, and care. We invite South Florida residents to schedule an appointment online to experience holistic dentistry firsthand. Readers are also invited to speak with a friendly member of our front desk by calling 305-274-0047. (i) Abel EL, Kruger ML. “Smile Intensity in Photographs Predicts Longevity.” Psychol Sci. 2010 Apr 21(4):542-4. Doi: 10.1177/0956797610363775. Epub 26 February 2010. (ii) Dogaru BC, Dogaru CD, Dumitrescu AL, Kawamura M. “Relation of achievement motives, satisfaction with life, happiness and oral health in Romanian university students.” Oral Health Prev Dent. 2010;8(1):15-22. Read the abstract. (iv) “The Ins and Outs of Gut Bacteria.” ABC News. Accessed 4 November 2013. (v) Linghong Zhou, Foster Jane A. “Psychobiotics and the gut–brain axis: in the pursuit of happiness.” Neuropsychiatr Dis Treat. 2015; 11: 715-723.